Please send corrections to the cemetery listing to Jeff Miller at jeff560@aol.com. Most of the research for the listing was done by Walt Casson. Patricia Raposa provided much assistance. The following history of the cemetery was written by Jeff Cannon. This page was last revised on Jan. 31, 2019. This cemetery was once nestled on the back roads between two small coastal communities. Those small communities exploded with development and became known as the cities of Port Richey and New Port Richey. The cemetery came into existence in 1916 when the ladies of the New Port Richey Civic Club saw the need for a cemetery in their own town. They began seeking local property to establish this cemetery. George R. Sims, one of the community’s prominent businessmen and property owners, generously donated the 2.2 acres where the cemetery was placed. Mr. Sims also helped with some of the early business decisions made regarding the cemetery. Through the efforts of the Woman’s Civic Club, the Board of Trade is taking steps to secure ten acres of land for a cemetery. The tract under consideration is about half way between Elfers and New Port Richey and near the Dixie Highway. It is high oak land, slightly rolling, and when improved will make a very beautiful resting place for the dead. It is the plan for the communities of Elfers, Port Richey and New Port Richey to purchase the land and form a cemetery association. Committees are being appointed to complete the plans and to incorporate the association. A notice in the Dade City Banner of Oct. 5, 1917, stated that an application would be made to Judge O. K. Reaves on Nov. 5, 1917, for a charter incorporating the Pine Hill Community Cemetery Association. The women listed as the original charter members were Minnie Broersma, Lonnie Clark, Alice Davis, Jennie Leach, Emma Rowan, and Nettie Sheldon. On March 27, 1919, the Port Richey Press reported that the Cemetery Association called a meeting to discuss and devise means for putting the cemetery area into proper condition. The association stated that their cemetery property needed to be cleared and fenced. They also discussed the plots needing to be laid out with stakes at the corners of each, for the purpose of later locating and identifying them. According to a Feb. 16, 1920, Port Richey Press article, New Port Richey’s new cemetery will be known as the Pine Hill Cemetery, which is beautifully located 1½ miles north of town. Mr. Randolph and one other party whose name is illegible in the article surveyed the 2½ acre plot. The articles states that soon lots and driveways will be put in. The article also states that Mrs. J. H. Moran was president of the cemetery association at the time. There are also several other articles, later printed, announcing the group gathering and cleaning the cemetery on a regular basis. There were funds collected for this purpose. On May 15, 1926, the cemetery property was deeded to the city of New Port Richey. 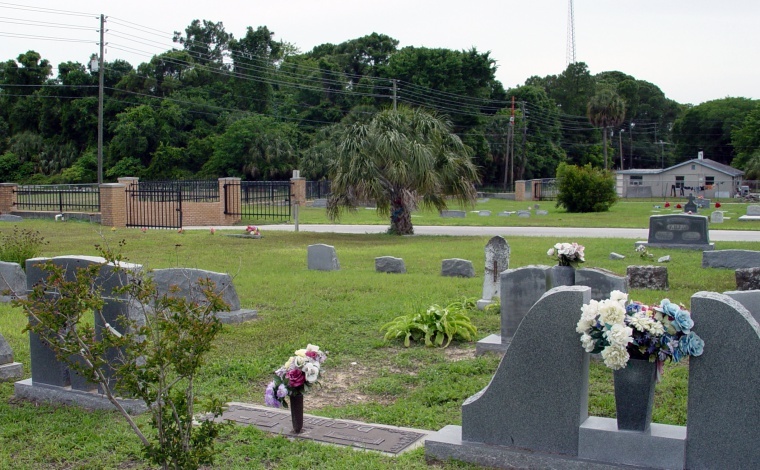 At this point the cemetery’s maintenance became the responsibility of the city of New Port Richey, along with the help from family members of the deceased. It still remains this way today. Inquiry elicited the information from Coucilman A. J. Pauels, who is in charge of the cemetery, that the first person buried in Pine Hill cemetery was C. E. Freel, a Federal Soldier, in 1917. Since then there were buried in the soldiers’ plot: Moses Grey, Hiram Seeley, John Daulby, Allen B. Fekler, S. B. Davis, and J. B. Huff. In addition learn the history of Moses Grey private or family plots, Benjamin Garrett, John O. Humphrey and John W. Gurney. At present there are but two stone markers in the soldiers’ plot. The government furnishes these stones free upon proving the identity of the soldier and his service to the United States. Councilman Pauels is anxious to learn the war history of Moses Grey, C. E. Freels, and John Daulby, and would appreciate any information given or he would like to be put in touch with any of their friends. The first burial at Pine Hill Cemetery is identified as C. E. Freel in the above 1930 newspaper article and is identified as Clifford E. Freels on the historical marker at the cemetery. Census and death records reveal that he was Columbus E. Freels, born March 17, 1839, in Morgan, Tennessee. He married Lola Teals. He is shown in Kansas in early records, in Cordele, Ga., in 1900, and in Rogersville, Tenn., in 1910. In the 1910 census he is described as a salesman of Singer sewing machines. He died in Pasco County on June 7, 1917. The death certificate does not identify the place of burial. Information for the death certificate was provided by Mrs. C. E. Freels of New Port Richey. For many years this cemetery suffered at the hands of numerous vandals. What the vandals didn't get the lawn mowers did. There are a number of unmarked graves in this cemetery many that at one time had temporary metal markers for them. The cemetery has been recently cared for and is in much better condition than it was in the days past. There are still many signs of past neglect that can be seen through unmarked graves and broken headstones. There are many establishing members of the cities of Port Richey and New Port Richey interred here, making this a historic cemetery. 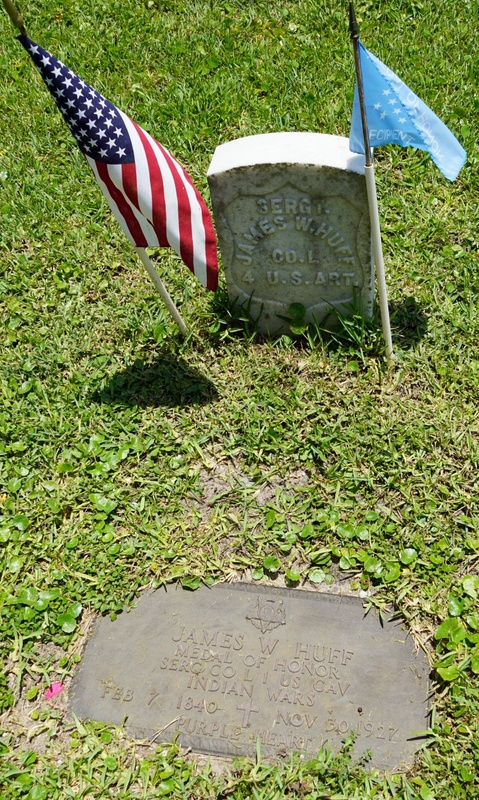 This is one of the few cemeteries in Pasco County that contains no burials of Confederate Soldiers however the cemetery includes more than 10 Union soldiers interred here. Among the veterans interred in the Pinehill Cemetery is Medal of Honor recipient James W. Huff. James was born in either Washington County or Washington Township, Pennsylvania ca. February 2nd 1840-1843, either the exact location or date of James’ birth is clear, as there are conflicting records on both. However an early map of Washington Township in Pennsylvania show the Hoff Family owning land and according to "Early Census Records of the Huff/ Hoff/ Hough Family" compiled by Max. K Huff the 1850 census for Washington Township list head of household John Hoff, 60 married to Catherine Hoff, 55 enumerated with children Joseph, John, Ann, Charles, William, James- born 1843 and Mary Jane Hoff, the only James in Pennsylvania census records close enough to James W. Huff’s age. According to service records during the Civil War James W. Huff enlisted in Vanburan, PA with the 85th Pennsylvania Infantry, on November 14th 1862 he was transferred and served with Company L. of the Fourth Regiment, US Artillery (Regular Army), however it was not this service that he received his medal of honor for. The cemetery has two parts, an east and west side. These two sides are divided in the center with road that circles the outside. The recent efforts of Walt Casson are not going unnoticed. Walt has been spending countless hours resurveying this cemetery for the purposes of designing a new plat map. Many times this is not an easy task since some of the burials are not always done in a straight line and sometimes they lay on the outside of the plotted spaces; the Pinehill Cemetery is in better condition than most in this respect. BROERSMA Mina “Minnie” Sep 18 1874 May 6 1938 ..
BUURVELD Pedro L. 1876 1945 Obituary has "Peter L. Buurveld"
CORNELL Samuel H. Mar 7 1848 Dec 16 1934 Obituary has Samuel E.
DAULBY John .. .. ..
FIRTH William Aug 28 1866 Sep 12 1934 .. FLUKE Thomas Jefferson 1857 May 25 1937 b. Saxton, Pa.
GREY Moses Oct. 9 1835 Feb 11 1920 ..
GURNEY Julia Armina Oct 14 1851 Feb 7 1934 b., Savoy, Mass. KENTO A. ... ... Vehko? KNOWLTON Wilfred F. Dec 2 1867 Jan 31 1929 ..
LANEGAN Harold Webster ... ... ..
MOORE William E. Apr 15 1854 Apr 18 1927 occupation: hardware merchant; b. Genesco, N. Y.
PUTWAIN Henry ... ... ..
SCHERER Julius A. Aug 4 1859 Jun 21 1932 Had lived in Elfers for 10 years, b. Worcester Mass. SHIDELER Lydia Jane Jul 5 1876 Jun 24 1939 Born near London, Ont. WALLACE Betty ... ... ?? ?